Joy Chudacoff is the leader for business & strategy design for women. Founder of Smart Women Smart Solutions®, Joy specializes in guiding already successful businesswomen from where they are to where they want to be. Leading by shining example, Joy provides guidance and support to help women live their greatest desired potential. Joy is heralded as “The Coach for Women” and she has x-ray vision when it comes to helping women discover their big ideas, dreams and goals. Joy draws from her own life and business experience to lead women in achieving success personally and professionally — on their own terms. Prior to launching Smart Women Smart Solutions® in 2005, Joy owned and operated a successful marketing firm. She decided to let that go (for a profit) in favor of creating a business that better suited her family first lifestyle. First and foremost, Joy is a wife and mother who knows what it’s like to be a woman who integrates family and passionate work together. She understands the importance of self-care, family and empowering women to make a difference in the world. An entrepreneur for over two decades, Joy is a woman who successfully integrates family and passionate work while teaching other women how to do the same. As a wife and mother of two, Joy understands the importance of self-care, family and continues to reach and expand her entrepreneurial dreams of supporting women. Joy serves as a Girl Scout Troop Leader to foster confidence and leadership in young girls who will be the leaders of tomorrow. Joy is the author of “What’s Next? : The 7 Steps to Discover Your Big Idea and Create a Wildly Successful Business” as featured in the Sacramento Bee and Book Review Station. Through her book and her one-on-one high level coaching, she skillfully guides women to create their own success. Joy is a professional certified coach, skilled group leader, highly sought-after motivational speaker and luminary thought leader. Her expertise as a coach, consultant, and strategist is highlighted by the success stories and results she generates for her clients. Her speaking experience includes keynotes at South Bay Women’s Conference, University of Nebraska Women in Leadership Conference, the Small Business Development Center in Chico, California, The Success Summit and Ali Brown’s Shine event. Beyond authoring her book, Joy has published over 250 articles for entrepreneurs. 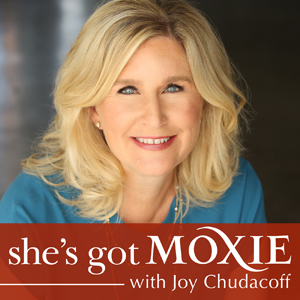 Joy hosts her weekly podcast, ‘She’s Got Moxie’ where she interviews today’s thought leaders, renegades, mavericks, pathfinders and of course, women who are flexing their moxie muscle! Her popular podcast has been ranked by iTunes as one of the TOP 100 Business & Career Podcasts to listen to! Joy is the recipient of The Platinum Excellence Award and the Founder’s Day Award for actively contributing to her local community. Joy has the distinct honor of being nominated for the Los Angeles Business Journal Women Making a Difference Award and most recently was selected to become a member of Leadership America, a small, select group of 50 businesswomen nationwide who gather on policies and decision making for women. She’s also a distinguished board member of The Broad’s Circle. Her proven, customized business strategies are the foundation for the latest evolution of her business, the Smart Women’s Edge. Joy masterfully collaborates with her clients to get the results they desire. The Smart Women’s Edge doesn’t mean you need to be edgy, in fact it’s quite the opposite. Joy helps women create a plan that works for their business and embodies feminine leadership skills. You may be wondering what types of women entrepreneurs/business owners work with Joy. She works with highly motivated women who have a desire to create freedom-based lifestyles so they can enjoy business and entrepreneurial success as well as fulfilling personal lives. If you have the desire to achieve success on your own terms, Joy has systems in place to show you the “how to” have it all. To discover which one of Joy’s programs is right for you, please visit her Coaching page or feel free to contact one of Joy’s team members. Looking for tips, strategies, insights, inspiration, and motivation to help you enjoy business success and a lifestyle that offers freedom and self-care? Browse Joy’s articles in the Smart Women Article Archives.